This product is excellent and reasonable priced! We ordered 3,500 bookmarks for elementary school students participating in our school pool program and everyone loves them. We also had a great experience working with the company. I highly recommend it! Unique eco-friendly product that is very different. CEP assisted me to find the exact product I needed. Great company with friendly customer support. Placed a bulk order for 4,000 bookmarks for the entire school. All the students use them during reading hours. The school board loved the fact that the bookmarks were eco-friendly. Nice eco-friendly product that's great for all students and people who need a bookmark. Thanks CEP for the great purchase. Great for fairs or festivals. Gain exposure with a cool twist. Love how eco-friendly these are! Ordered a few hundred for my schools event and they were perfect! I can't believe how great Custom Earth Promos service was and how dedicated they were to helping me get exactly what I needed! Thank you CEP! Pretty neat that soy ink is used when making this product! Great product it gives you a different sales edge. I had so many questions. I was able to get on the phone with Cory and he answered them leaving me at ease after the conversation. Needless to say I placed an order for 3,000 bookmarks. We couldn't be more impressed with this item. The printing looks great. Happy to help the earth-friendly movement with this purchase. Such a creative way to endorse an earth-friendly way. The graphics on the bookmark was so distinct. Looked better than thought. I thought this was a different way to gain some exposure with the different venues I attend. I put my name on the bookmarks, explained what they were about and got some really good feedback. A really classy bookmark. Like the little accents. Couldn't be happier with our order. LOVE!! all the different aspects to this seed paper bookmark. We got these with a garden club logo on them. All our members thought they were the greatest thing ever. The best way to go green. 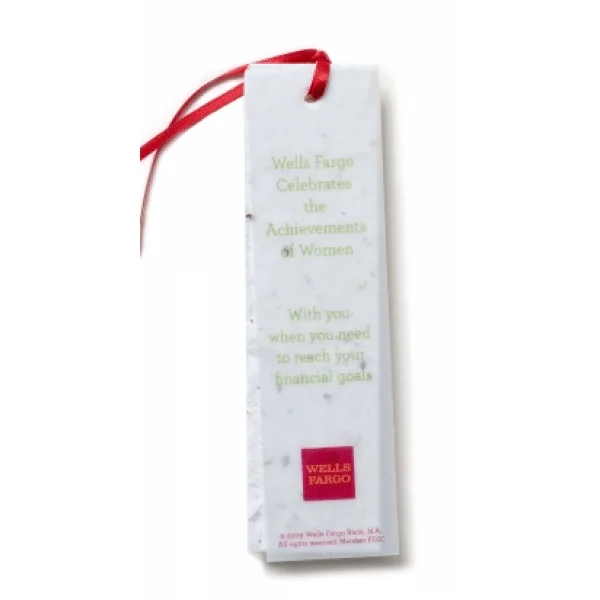 Ultimate eco-elegance is captured with Vellum & Seed Paper Bookmarks from Custom Earth Promos. The translucent vellum bookmark includes full-color customization on one side and overlays a large swatch of seed paper. Vellum and seed paper are equally sized at 2" W x 7.75" H, creating an eye-catching three-dimensional look to the bookmark. We utilize a 4-color proprietary printing process which maintains our high germination seed paper standards. Using planet friendly CMYK printing, all-natural, soy-based pigments are sprayed onto the 100& recycled bookmarks to create a stunning product. An "earthy" hemp tie holds the vellum in place atop the seed paper, completing the eco-attractive presentation. 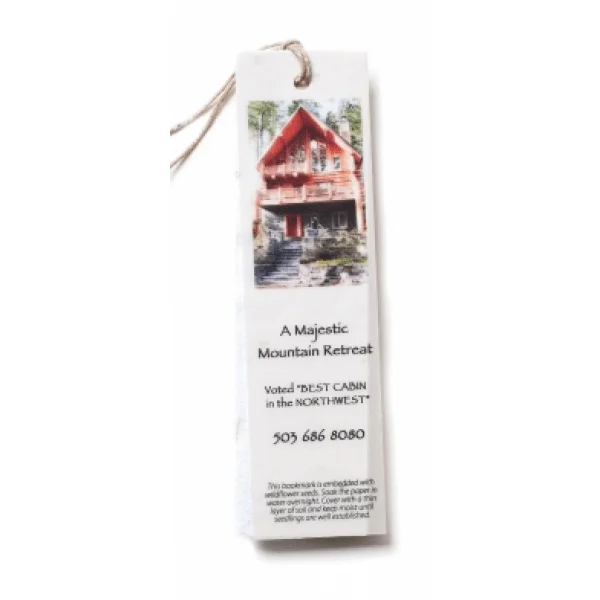 Whether the goal is to spread awareness, solidify the eco-responsibility of your brand image or promote a specific event, Vellum & Seed Paper Bookmarks will effectively advertise your message in affordable and eco-attractive style. 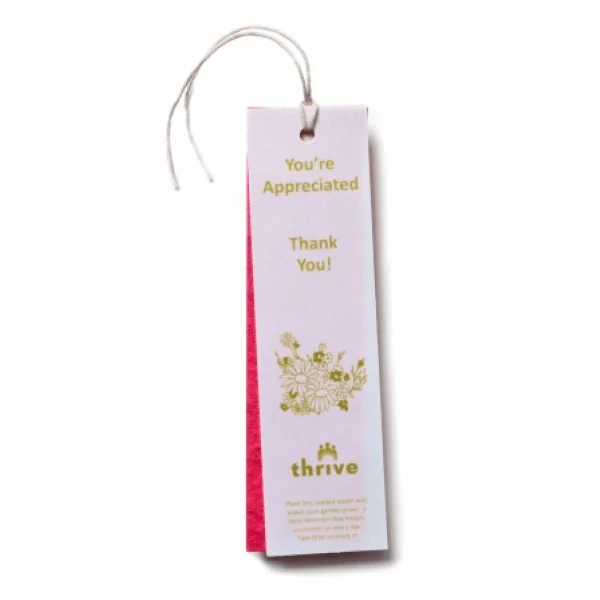 Customize your bookmarks to empower environmentally conscious campaigns, such as an Earth Day sale or to announce a "going green" initiative of your business. Establish your brand as ecologically invested while form lasting bonds with customers who join you in this planet benefiting process. 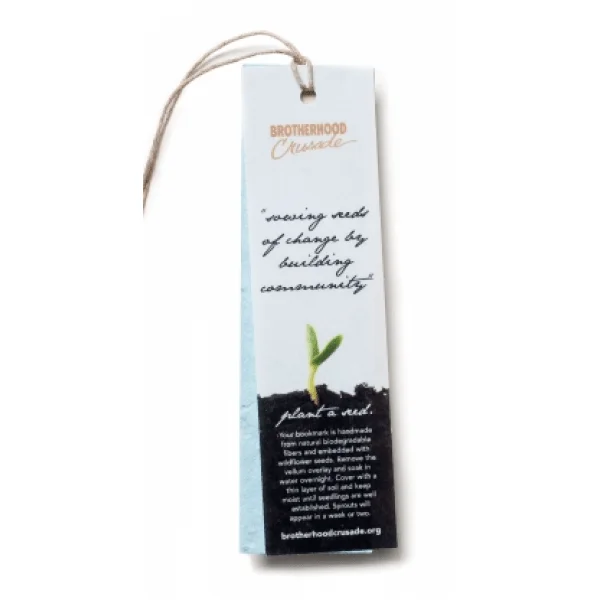 When planted under a layer of soil and given proper care, seed paper bookmarks will bloom into living reminders of your brand's sustainability sentiment. Establishing your brand as eco-ethical and keeping customers aware of waste reducing standards is vital to the succeeding businesses of tomorrow. 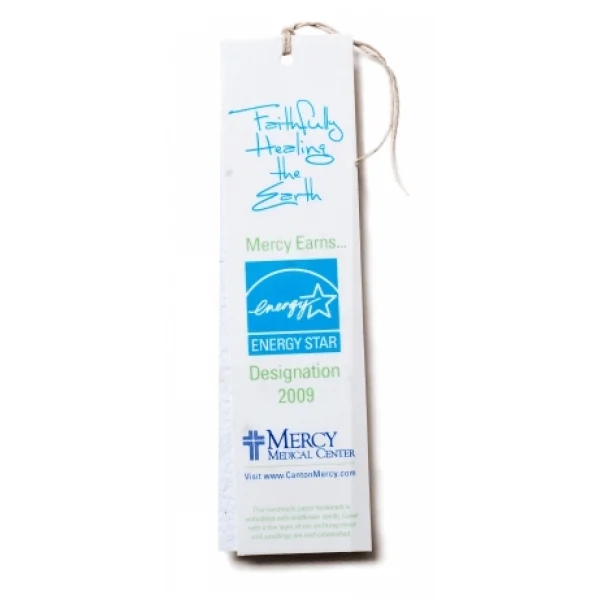 Proactively promote your eco-friendly brand or initiative with Vellum & Seed Paper Bookmarks from Custom Earth Promos. Work with our expert design team to create a multi-dimensional, eye-catching design blueprint that genuinely conveys the core ideals and aesthetics of your brand. Our talented artists ensure your custom graphics are printed in premium full-color quality on our premium vellum paper. Add even more dimension and creativity to your design with a vibrantly colored seed paper swatch that complements your custom graphic. You'll be amazed at the power and potential of these ready-to-plant bookmarks. Our seed paper & vellum bookmarks are 100% recycled, recyclable and planet friendly. With complete freedom to customize the design to match your brand, they're an ideal option for education, travel, hospitality, beauty, retail and healthcare industries. Our seed paper is handmade in the USA from USDA-approved, GMO-free seeds with the highest germination rates and ability to grow in any US climate. Seed paper pulp is created with undyed post-consumer paper that is recycled and then embedded with our most popular mix of perennial and annual wildflower seeds. The pulp is then used to create large sheets of seed paper in a 30 kW solar-powered facility that empowers us to maintain the highest germination rates possible and eliminate eco-impact. In accordance with Custom Earth Promos' all-natural philosophy, Seed Paper & Vellum Bookmarks are made strictly from eco-friendly materials that are recycled, recyclable and not only biodegradable, but beneficial to the ecosystem when planted. We proudly uphold these standards by using only 100% post-consumer recycled products, all natural soy-based pigments and USDA-approved, non-GMO seeds. By only using white, undyed recycled paper, we eliminate any potential risk of hazardous chemicals from previous dyes. Furthermore, we eliminate any and all eco-impact by manufacturing seed paper bookmarks with solar power in the USA. Promote your message with a planet-friendly product that you'll be proud of, guaranteed to be completely safe for both the environment and your customers. Work with our in-house design experts to build your bookmark design blueprint from the ground up, choosing a custom graphic to imprint on the vellum, a seed paper color that complements your vellum graphic and even a custom seed mix! We offer a variety of flower, herb, vegetable, tree and grass seed mixtures to choose from. Get creative by using a seed mix that blooms with the color(s) of your logo, giving your message even more lasting power. Orange logo? Try using vibrant orange seed paper infused with a carrot seed mix. Seasonal mixes for the 4th of July, Halloween and Christmas are also available. Our talented team is always coming up with new ideas, so be sure to ask about our available specialty seed mixes!